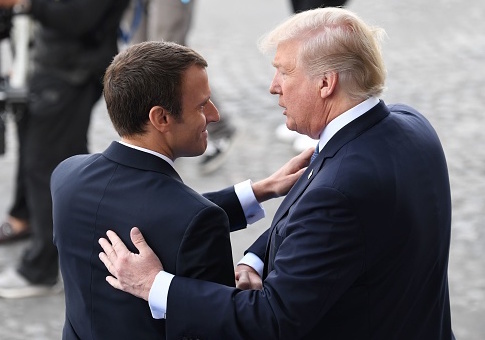 CNN devoted nearly 500 words Friday to a second-by-second analysis of President Donald Trump's handshake with French President Emmanuel Macron. CNN editor-at-large Chris Cillizza penned "A second-by-second analysis of the Trump-Macron handshake." Cillizza clocks the handshake as lasting 25 seconds, and takes the reader through every single second, complete with gifs. "Macron goes for the hand pat but Trump goes totally next level going bro handshake OUT OF NOWHERE…," reads one entry. "Or is it Macron who goes ‘bro'? I can't tell because Macron obscures the camera shot." Cillizza had previously shown zealous enthusiasm for a tweet appearing to show the Polish first lady snubbing Trump's attempt at a handshake. But that video turned out to be deceptively edited. First Lady Agata Kornhauser-Duda went to shake First Lady Melania Trump's hand first, and then shook Trump's. Cillizza also wrote a piece in May exploring in depth why Trump tweeted the typo "covfefe." "That lack of discipline reveals that there is simply no one who can tell Trump ‘no,'" Cillizza wrote. "Or at least no one whom he will listen to." This entry was posted in Politics and tagged Chris Cillizzaa, CNN. Bookmark the permalink.